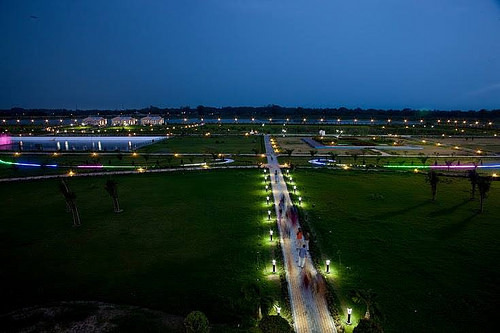 New Town Eco Park or Prakriti Tirtha is an urban park in Rajarhat, Kolkata The park is situated on a 480 acres (190 ha) plot and is surrounded by a 104 acres (42 ha) waterbody with an island in the middle. The park has been divided into three broad parts. One is ecological zones like wetlands, grasslands, and urban forest, the second one is the theme gardens and open spaces, and the third is the urban recreational spaces. The Eco Park is further divided into different sub-parts according to the different types of fauna planted. The park has different areas like wild flower meadows, a bamboo garden, grasslands, tropical tree garden, bonsai garden, a butterfly garden, a play area and an amphitheatre. There is an eco-resort which includes an area where handicrafts from different part of the state are exhibited. Winter is the best time. 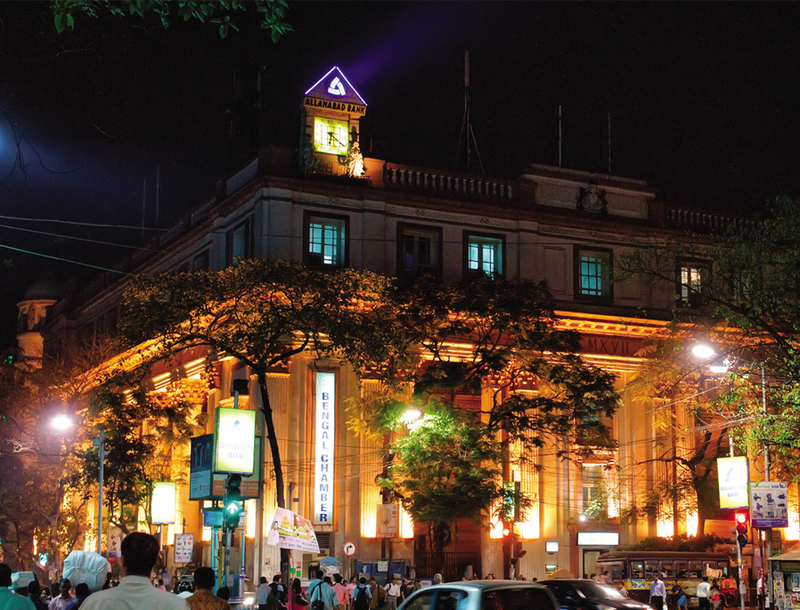 Glass House on Sabuj Sathi – “Sabuj Sathi” is the name of an Island. This island is in centre of the huge lake of Eco Park. Its area is 7 acres. It can be accessed only by boat. This is an uninhabited island. On this Sabuj Sathi Island an amazing glass house has been built. All four sides of this 2,800 square feet building is made of glass. The 360° view of the Eco Park across the lake through the glass walls is simply spectacular and awe-inspiring. There are three open-air viewing galleries, green lawn and paved pathways in the island. More than 100 persons can assemble in Sabuj Sathi Island and glass house and its surroundings for official, corporate or family programmes. Wedding / Birthday parties, product launches and brand promotion can be done in a tranquil environment that is possible only on the zero populated island like Sabuj Sathi in Eco Park. Amphitheatre – Artfully conceived, the semi-circular open gallery can hold up to 2,000 people. The stage-greenroom complex is, as if, 'floating' on water. The adjoining food gallery has interesting brick-twisted pillars. 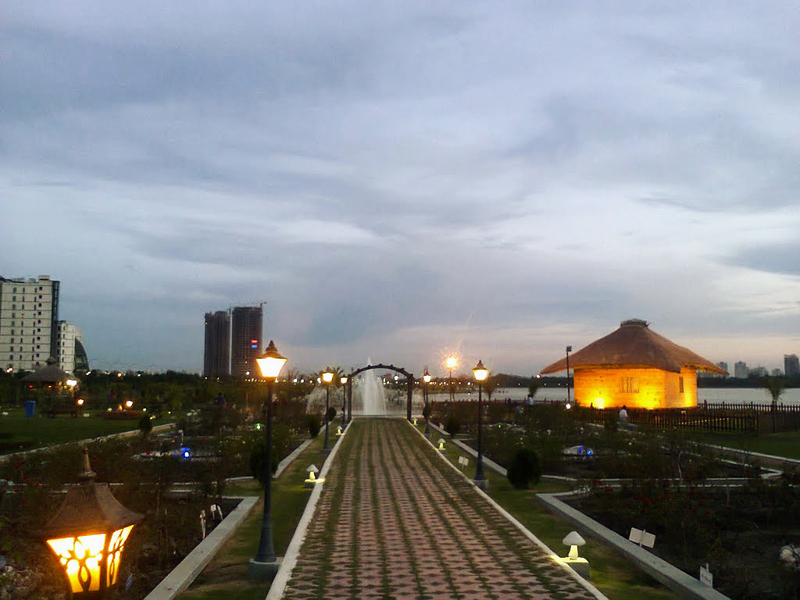 Lake Front Promenade – Spine of the Eco Park, the Promenade is a paved, coconut-tree lined pathway designed for the visitors to Enjoy the beauty of the 112 Acre water body that defines the Park. Rabi Aranya– With reference to the spirit and ambience of Santinikean Ashram, Rabi Aranya features trees and plants mentioned by Tagore in his literary works. Other elements of the garden include, among others, a commemorative pavilion, walkways, seating area, lotus pond, etc. Tropical Tree Garden– As the name suggests, this zone caters specifically to tropical trees. Even with the recently planted trees, one can get the aura of a tropical forest, especially a Bengal one, in the middle of New Town. Wild Flower Meadow and Formal Garden– A flower lover’s zone, these two areas will have varieties of both garden and wild flowers to enjoy. Near to one of the food kiosks and overlooking the lakefront promenade, a walk among the meadow and the garden are highly solicited. Rose Garden– This space is a long stretch of walk with varieties of roses planted along, colourful fountains sprinkling by, sculptures to feast the eye and occasional benches to rest a little. Eco Children’s Park– With fountains, play areas, sculptures and elevated platforms connected by causeways, this area is a dynamic space intended to stimulate play and learning experiences in a garden setting. Formal Garden 2– Located between the upcoming Visitor Centre and Eco Children’s Park, Formal Garden explores the concept of vertical gardening amidst a flat landscape. Graffiti Walls– The wall along the South Parking has been rejuvenated by colourful paintings. The two sides of the wall had been taken up by two eminent artists of our era - JogenChowdhury and Subhaprasanna and transformed into beautiful canvases of artwork. Butterfly Garden– The garden is poised to consist of a large dome to enclose a plant habitat consisting of with different species of flowering annuals and perennials that support a large range of butterflies organised around a circular body of water. Play Area– Right next to the Butterfly Garden, the Play Area offer learner’s golf courses amidst a green landscape. Bamboo Garden– The Bamboo Garden is a specialised garden showcasing multiple varieties of bamboo. The planting effects is designed to create a variety of experiences through imaginative bamboo plant mixes with species ranging from giant varieties to short grasses. Fruits Garden– A thematic zone dedicated to the Bengal delicacy of fruits, to showcase the bountiful nature of this part of earth and to encourage nature learning through identification of fruit bearing trees. Food Court– The Food Court will provide more affordable dining options to the visitors. Around 20 food stalls are being arranged in a cluster around a square courtyard that also has four dining pavilions. Adda Zone– Placed opposite to the Artist’s Cottage, the Adda Zone consists of simple seating arrangements overlooking the spectacular view of the lake and the musical fountains. 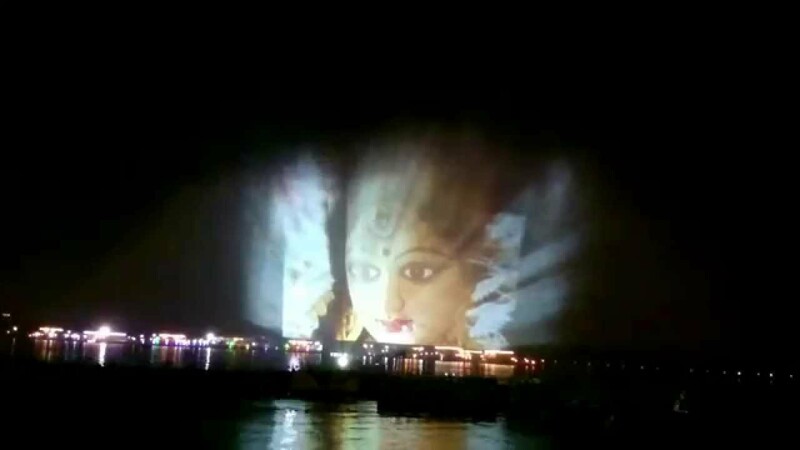 Musical Fountain– As the name suggests, fountains, music and laser shows have been prepared on the Northern banks of the lake. The view is visible from all around the Park when the fountains start showering in the evenings and laser shows tell storeys on the water screen. Tea Garden- A touch and feel of Darjeeling has come up near Gate No. 1. This zone includes winding pathways through a tea plantation area – complete with a composting plant. Mask Garden- Near the Northern parking lot and adjacent to the tea garden, this new zone has masks from various districts of West Bengal, then various states of India and finally from various countries of the world. Eco Island- A vast area of 480 acres of green terrain surrounding a water body is being developed in Eco Park. Within Eco Park there is an island named ‘Sabujsathi’. 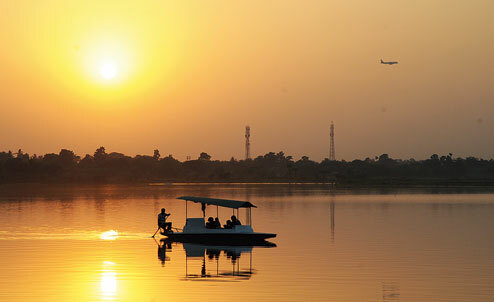 The island is in centre of the huge lake of Eco Park comprising an area of 7 acres which is accessible only by boat. This is an uninhabited island. On this Sabujsathi Island an amazing glass house has been built. All four sides of this 2,800 square feet building is made of glass. The 360° view of the Eco Park across the lake through the glass walls is simply spectacular and awe-inspiring. There are three open-air viewing galleries, green lawn and paved pathways in the island. 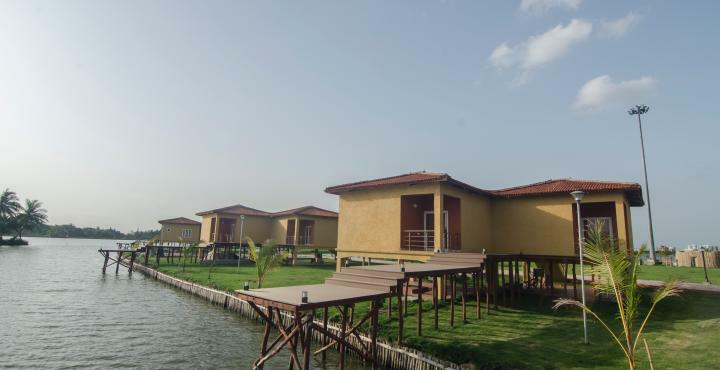 Apart from the magnificent Glass House, there are also 22 well-furnished double bedded cottages along with one Cafeteria named CAFE EKANTE in the island. Paddle Boating- Paddle boats are available at a charge of Rs. 50/- for 4 persons for 30 minutes. The jetty is located near Gate No. 2. Shikara Riding- From the same location as above, Shikara riding can be availed at a charge of Rs. 150/– for 4 persons for 30 minutes. Life vests are mandatory for all kinds of boating. Duo Cycling- Charges Rs. 150/- for 2 persons for 30 minutes. Speed Boat- Capacity 2/25 heads. Charges Rs. 50/- per person per round. Bird Watching- Charges Rs. 10/- per person. Gun Shooting- Charges Rs. 50/- for 10 shots. Archery- Charges Rs. 50/- for 5 arrows. Kayaking- Adventure lovers can go for Kayaking at a charge of Rs. 150/– for 30 minutes. The jetty is located near Rabi Aranya. Land Zorbingand Water Zorbing- Eco Park offers the exciting activities of land and water zorbing near Rabi Aranya. The charges are Rs. 150/– per person, for 200 m land zorbing & 15 mins water zorbing. Cultural Events- The Open Air Theatre inside Rabi Aranya comes to life on Saturday evenings when cultural activities such as music, dance, drama, are held. 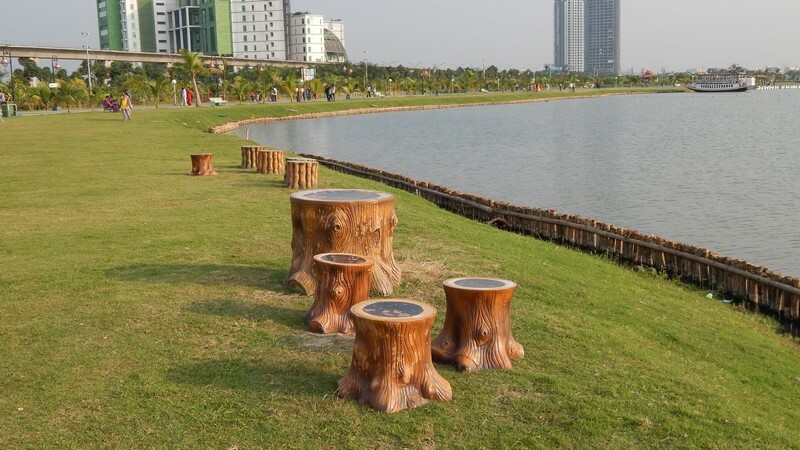 Additionally, there are intermittent events updates of which may be found on HIDCO/Eco Park website.gaming Zone has been developed in Bamboo Garden to attract game lover. The setup has 12 gaming PCs with best games like Need for Speed, Call of Duty, Counter Strike, Age of Empires, Angry Bird and many more games. Charges are Rs 50 per hour per head. Parking Lots- Presently there are two parking lots for Eco Park. The old one near the Eco Children’s Park has capacity to park about 100 cars, while the newly developed place near the Southern entrance has over 250. • Rs. 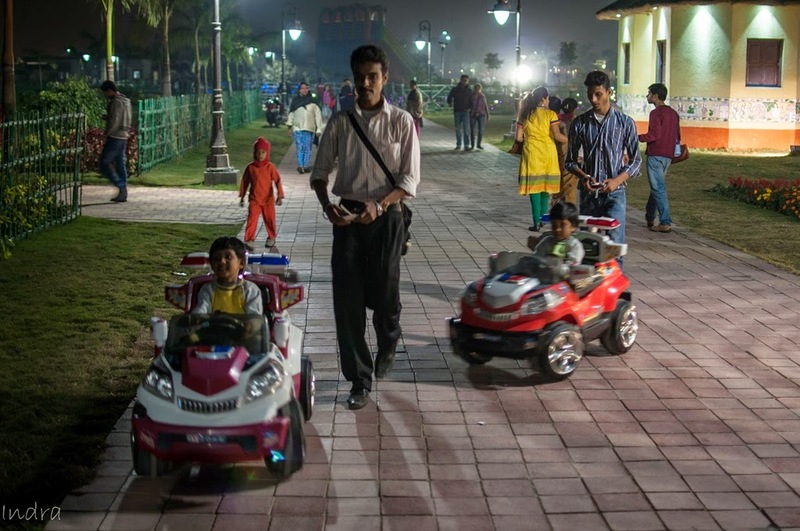 50/- per for 4 wheelers. • Rs. 20/- for 2 wheelers. Eco Carts- There are Eco Carts to ferry passengers between Gate No. 1 and 5 with sitting capacity of 5-9 passengers. Toilets- Toilet facilities are available for free in three locations. There are two toilet blocks near two parking lots and a bio-toilet set at the junction of Rabi Aranya and Wildflower Meadow. Food Kiosks- Snack and water are available for purchase at intermittent locations inside the park – especially since outside food and beverages are not allowed inside. • Tuesday to Saturday = 2:30 P.M. to 8:30 P.M.
Sunday & Holidays = 12:00 P.M. to 8:30 P.M. The park is closed on Monday for maintenance. Park entry and Ticket counter closes at 06:30 P.M. Entry charge is Rs 20/-. • Sunday & Holidays = 12:00 P.M. to 8:30 P.M.
• Park entry and Ticket counter closes at 06:30 P.M. The park is closed on Monday for maintenance.